Description: Eden Atwood has a voice that is many things - seductive, plaintive, sensitive, gifted with perfect intonation and phrasing, and entertaining. Her vocal style shows the influence of many jazz singers including Jimmy Scott, Shirley Horn, Sarah Vaughn and Billie Holiday. 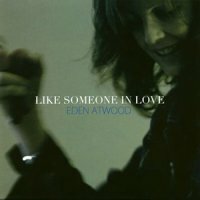 Like Someone In Love is a great follow-up to her 2009 release, Turn Me Loose. Recorded in three sessions in 2009 and 2010, this is a collection of standards. In addition to David Morgenroth, Chris Colangelo and Joe LaBarbera who recorded with her on the previous album, she has Kendall Kay on drums and Azar Lawrence on tenor sax on several tracks. Another incredible vocal album. Recommended! Recorded March and June 2009 and June 2010 at Umbrella Media, Chattsworth, California.